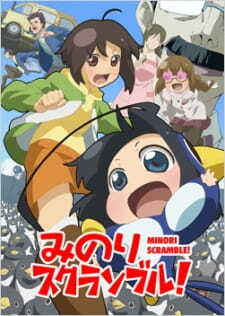 Minori Scramble is something I downloaded and kinda ignored for more than 2 years (sitting on my downloads folder with tons of other neglected anime). I was expecting a nonsense (plotwise) and not-entertaining-enough anime. Well, I was correct for the nonsense plot, but it was quite entertaining and will give you some good laughs. It is a pure comedy show with cute characters and tons of penguins. Minori, our main character, is scared of penguins (though her parents aren't, specially his penguin obsessed Otou-san). His dad then proceeds to make a weird half-penguin, half-loli child, all android thing that will help cure her fear towards the cute creatures. I admit I was kinda freaked out at the start by the android being able to switch it's head between scary penguin and cute child by literally twisting its head, I was also scared by the cute penguins appetite for a lot of live lobsters, and the child having a small penguin body doesn't look normal and bothered me too. Anyway, it is a crazy ride, with crazy characters that has good jokes here and there to keep you watching for 38 minutes.